2003, an old man holds an old letter. It was written to him in 1944, December, after the Red Army liberated his hometown in Poland. When we speak, we when try to convince others of something we consider vitally important, how many people actually listen? And is it worth the effort? 1942, Bolechow, Occupied Poland, a young man name Bumo understands that the end is close, for the Jews of his town. He speaks to his parents and his three young sisters, he tells them the time to act is now. The time to leave is now, the time to listen is NOW. The young man, heartbroken, leaves home in the footsteps of the retreating Soviet soldiers. He takes with him photographs of the family he loves so much. He takes photographs and memories. He and a friend begin to walk. Years earlier the great Zionist leader, Ze'ev Vladimir Jabotinsky travels throughout Europe crying out, "Jews, leave now while there is still time, the end is near!" A few listened, very few. They became the founders of the State of Israel. They lived to see a new day. But most, most did not listen. They called him a "Doom sayer", a "Fascist" a "Prophet of Doom". Like Dr. Herzl before him Jabotinsky died very young, he died of a broken heart. People did not listen. Young Bumo tried to convince others to join him, but they said, "This is our home, this is where we live, this is where we shall stay." They could have added, "This is where we shall die." Which is in fact what happened. Of the 6,000 Jews of that area 48 survived the German occupation. They died in the most cruel ways. Unspeakable horror. December 1945, the war is not yet over but much of Europe has already been cleansed of the Nazi tyrant. Young Bumo is hopeful that he will reunite with some members of his family. He writes to a dear neighbor, a Gentile with whom the family was friendly. He asks about his family. He is hopeful. An old man named Bumo holds an old letter, memories, thoughts of words that were not heeded, a warning cry that was not heard. Have times changed? Is hatred and violence erased from the world? You know the answer. And yet, how many people are taking action? How many people are taking these words to heart? 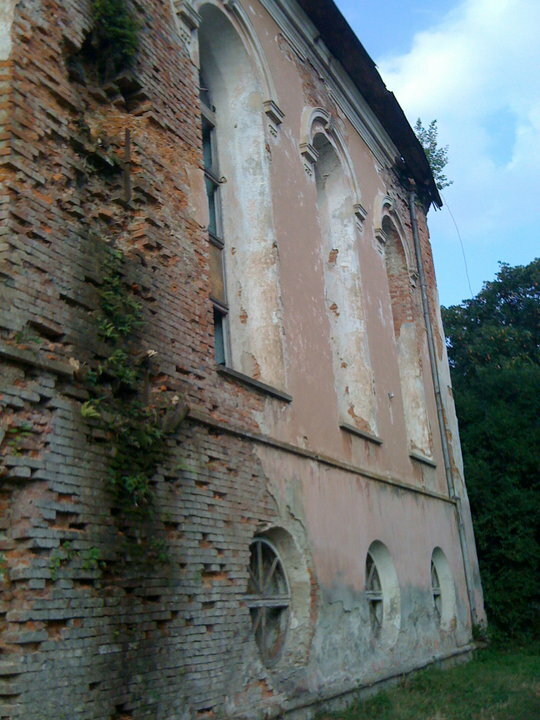 What remains of the Jewish community of Bolechow, as in most of Europe; destroyed or semi destroyed, or neglected old Houses of Prayer, cemeteries and memories of a once thriving Jewish life. Prayers to God were once offered in this House of Worship.